Please join us for an informal lunchtime conversation with Andrés Knobel, analyst at the Tax Justice Network. As part of an ongoing initiative by the Center for Human Rights and Global Justice to foster dialogue on the relationship between fiscal policy and human rights, this discussion will take a close look at how tax havens enable illicit financial flows, particularly in light of the recent scandals generated by the Panama Papers and the Paradise Papers. A lawyer by training, Knobel is an expert on illicit financial flows, particularly on secrecy and the strategies that allow individuals and entities to evade taxes, launder money, or hide proceeds of corruption, depriving states of revenues needed to deliver on their human rights obligations and exacerbating inequalities. Knobel is one of the lawyers behind Tax Justice Network’s flagship publication, the Financial Secrecy Index. Widely covered by the media (e.g. 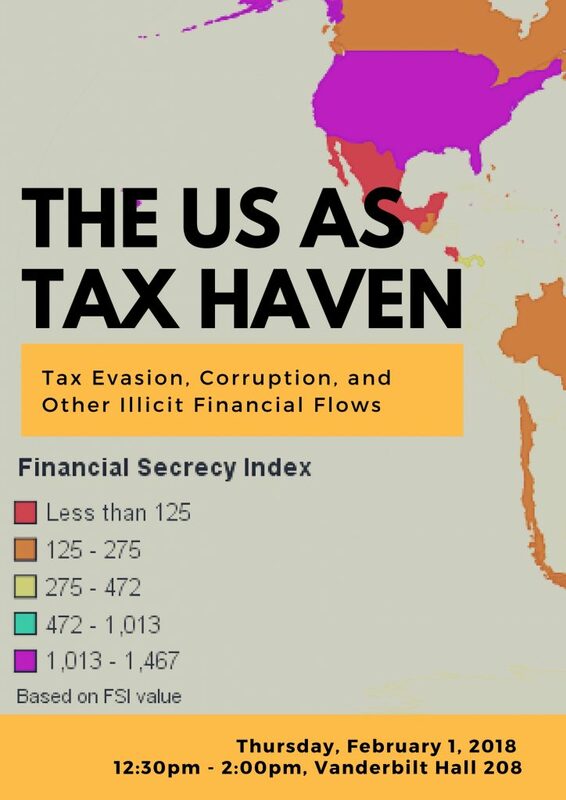 The Economist, Bloomberg), the Financial Secrecy Index is an evidence-based methodology that identifies the world’s worst tax havens, shedding light on the role played by major economies—including the United States—and offering an alternative perspective to the usual list of tax havens identified by the European Union, the OECD, and Transparency International’s Corruption Perception Index. The talk will address the research that goes into the Financial Secrecy Index and how the U.S. measures up. In particular, Knobel will discuss the lack of progress made by the U.S. in relation to the ABC of Fiscal Transparency: Automatic Exchange of Bank Account Information (FCTA/CRS), Beneficial Ownership registration of companies, trusts, partnerships and foundations, and Country-by-Country Reporting (BEPS Action 13).